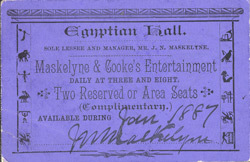 John Maskelyne and George Cooke took over the Egyptian Hall Theatre in Piccadilly in 1873 and made it the centre of stage magic in London. Hugely popular, they billed themselves as "Royal Illusionists and Anti-Spiritualists", taking a competitive stand against stage magicians who tried to convince audiences that their illusions were "magical" or "spiritual". In this same spirit, Maskelyne and Cooke exposed as fakes an American magic duo, the Davenport Brothers, by performing the Davenport's act and telling audiences how each trick was done. They blended comedy, illusion and conjuring, changing their act frequently to ensure that audiences were never bored.